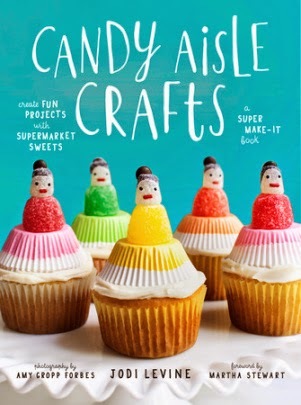 Jodi Levine's Candy Aisle Crafts is a fun "cookbook" of crafting with food ideas. My little chef snatched this book up as soon as it arrived, and he is inspired by the unique and doable recipes. Formerly with Martha Stewart Kids (which I miss so much! ), Jodi's familiar style of kid crafting shines in this irresistible book. Each project features pre-made candies and other ingredients like ice cream cones, so most of them require little advance prep. There are also some cake and cupcake decorating ideas, but the cake recipes are not included. Instructions will tell you to have something like "pink frosted cupcakes" in the supplies list. I like having the items listed in bold at the beginning of each set of instructions, so I can make my shopping list easily and determine how much advance prep is required. The recipes in Candy Aisle Crafts are kid-friendly, and kids are featured in many of the photographs. Several of the projects would be cute for birthday parties for kids from baby on up, and many of the projects are adaptable for holiday fare. Some of the ideas are super-simple, such as shaped marshmallows for hot chocolate, and some of the ideas are elaborate, such as the cookie castle cake. But all of them are really accessible. Some of the activities include making flowers from gumdrops and Necco Wafers, peppermint ornaments, clown cupcake toppers, gummy animal menorah, marshmallow birds, and triangle tree pops. My young son is able to follow the instructions and create his own version of all the projects we've tried, without frustration. It's no fun to pick up a cookbook or craft book and quickly discover that you'd have to be a professional to attempt them. Candy Aisle Crafts is practical, yet features beautiful and unique food crafts.